one of a kind focal bead. This bead will make your art jewelry a truly stand out piece. * I hand shape and form each piece out of a high fire (2400 degrees) paper clay. The paper clay is made using old recycled egg cartons creating a bead that is light and sturdy. * All my pieces have some design detail. 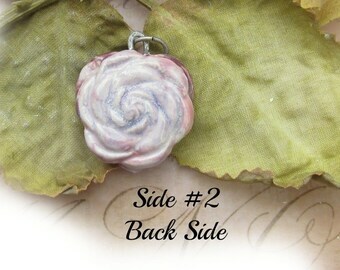 * Side # 1 of pendant has a flower pattern to the top of the pendant. 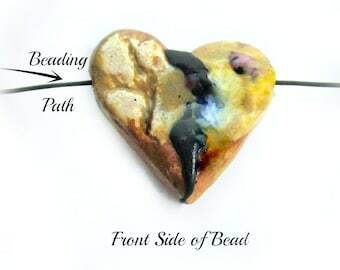 * This piece is part of my Heart Bead Series. and I will never have another just like it. 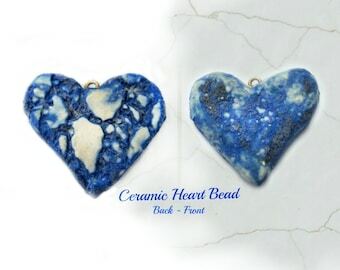 * The heart bead is glazed in Transparent Ancient Purple color that lets the white clay show . 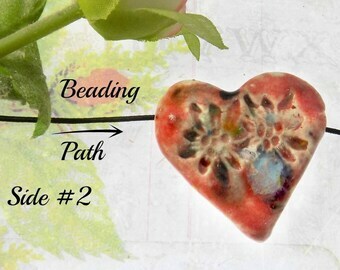 This listing is for the 2 sided pendant you see in pictures. Have a question about this just ask. 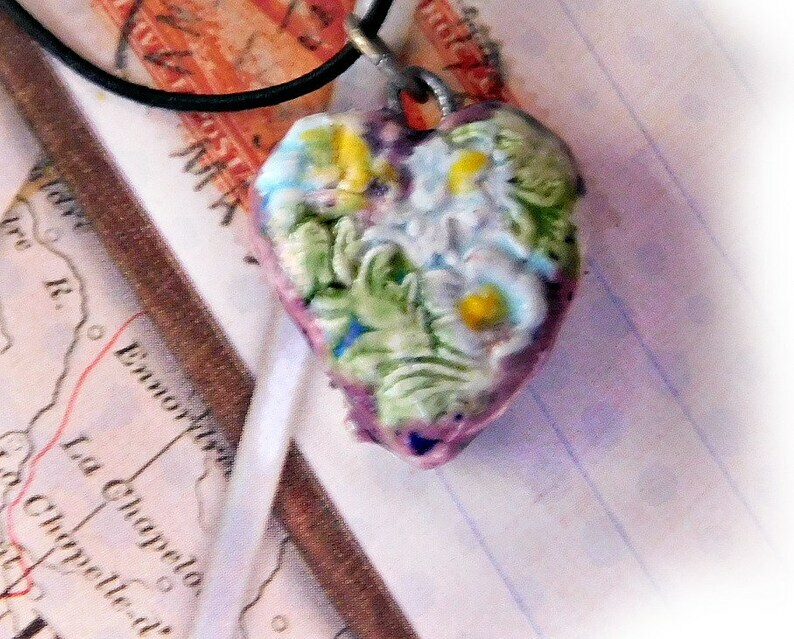 * The Heart pendant measures; 1 inches wide x 1 inches long. Send me a message via the Conversation link at the top of the page if you have any questions. 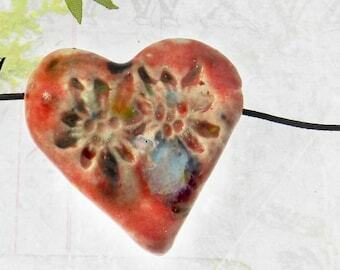 Please visit my shop http://www.artrageousclay.etsy.com for more selections. By the way - The lights reflect on the pieces because of the glossy finish of the glaze that is on the bead. The picture doesn't do them justice! The listed charge for postage includes shipping materials as well as the postage. Cute as can be! Looks just like the picture. I really like the colors of this pendant! Very happy! Lovely pendant! Great shop! Fast delivery! Oh so pretty, very happy with my purchase! I accept Paypal / credit Cards I ask that payment be made within 48 hours. I also combine shipping with my other Etsy store, www.firedupladies.etsy.com. I will refund the difference in shipping. I am also more then willing to do "layaway" if you like a piece and need to make more then one payment. Please contact me and we will work out the details. It is my hope that you are satisfied with every item that you purchase from my shop. However, in the event that you are not satisfied, let me know in 7 - 10 days and I will accept a return or exchange for a similar item. I will issue a refund (minus shipping) or an exchange once I have received the item back in it's original condition. All mailing is done in a box and bubble envelope or in a box if to big for the envelope. All are well packaged for safe arrival. International Shipping - I ship using USPS first class international. Please allow 18 - 30 business days for the package to clear customs and be delivered. Customs fees/duty taxes/VAT (Value Added Tax) are the buyer's responsibility. I mark my all packages as merchandise and put the invoiced value on them. I am more than willing to wholesale. Convo me for terms. I am both convo and trade friendly, so free to contact me if I can help or you just want to drop a line!